The irrigation system came through the winter nicely but we are seeing some signs of long-term deterioration. This is normal after fifteen years of operation. Some of our valves, which allow us to section off specific pipes for minor repairs, are beginning to falter. 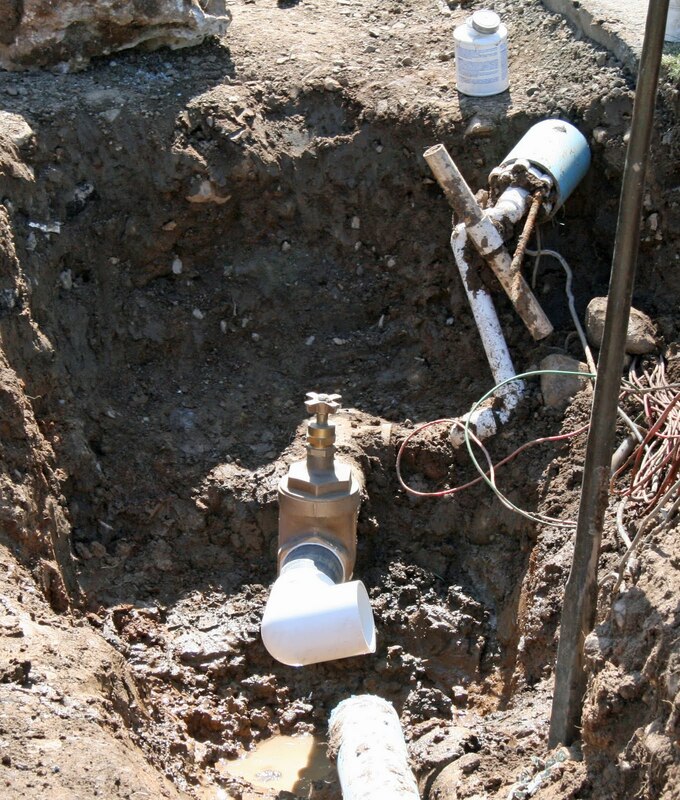 These valves are important because they allow us to perform repairs without shutting down large portions of the system. 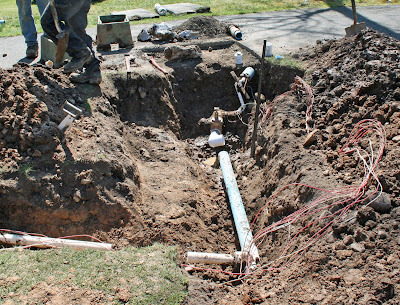 The following pictures show the replacement of the three inch shut-off valve for #10 green. 1ST COOL BLOG TO CHECK OUT! First of all, blogging may be fairly new to most of us. We are on the cutting edge of uninhibited member and global communications! Beyond our world of The Farms CC there are other very notable blogs which I follow. They might be of great interest to our members. My intention is to periodically expose you to those blogs which I find warranted. I want you to experience the vast opportunities which are presented by this form of communicative information. While blogs are written by individuals expressing their uncensored opinions, they can be a tremendous resource for all. It's fun to see the golf world through the varied eyes of local and national industry professionals and their different perspectives. Here is my chance to introduce you to the first of some very interesting sites that I enjoy! Anthony is an outstanding journalist that writes "free-lance" for many turfgrass publications. He has already published two books that I've enjoyed, "To The Nines" and "Haunted Golf: Spirited Tales From The Rough". Anthony is a local writer residing in Middletown and is in the process of trying to build a nine hole course in the area. What you may not know is that Anthony worked on the maintenance staff at The Farms CC years ago. He has a wonderful understanding of golf from both the superintendent's and architect's perspective. He has been a guest speaker at conferences across the nation and his work can be viewed in many golf publications regularly. There are several things I love about his writing. His unsurpassed journalistic integrity, love of the game and the passion he expresses both written and verbally. He is genuine! When and if you have the chance to spend time with him, you walk away knowing that he is incredibly passionate about the game. Like most of us who have made this our profession, regardless of our niche, it is the consistent unbridled and uncensored passion of the game that drives us to both succeed in our explicit capacity and share that passion with anyone that will listen. Anthony is one of those people! Not really a surprise for the maintenance staff. 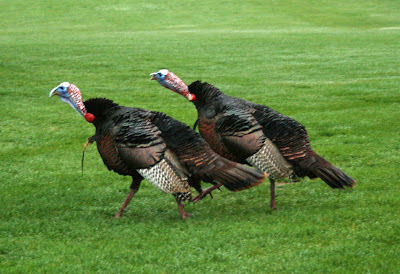 We get to see an abundance of wildlife on the course during the off-peak hours. Looks like love is in the air for these tom turkeys on the sixth hole. 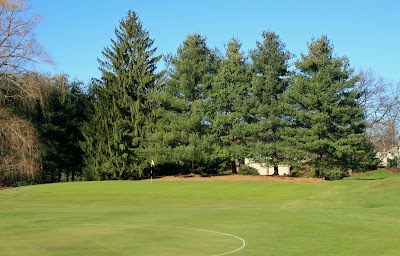 A variety of plant materials were used in the landscape bed between nine green and the practice green. The main objectives of the planting were to create a barrier that improves safety, reduces noise and visual distractions while improving aesthetics. Another factor which weighed heavily in plant selection was making sure the materials would not be too tall at maturity. We did not want sunlight to be blocked on the practice green as was the case before. Remember that all plantings must be designed for what they will look like in five years. Not what they look like the day they are planted. We look for superior results over the long term. Post-project maintenance is integral to a speedy recovery. We are fine tuning all work that the outside company has performed. We are touching up sod work, overseeding, fertilizing and topdressing the entire area to facilitate the fastest recovery possible! Monday, April 12th, I spent my afternoon at the wholesale nursery picking out the plant material that will provide some of the finishing touches to the entire project. 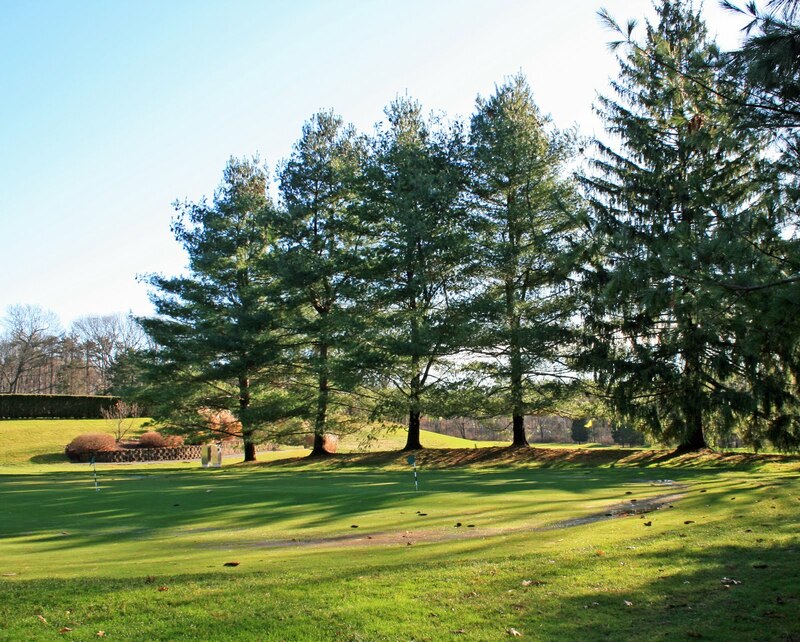 I was able to secure some beautiful yet functional landscape plants that will provide a wonderful and aesthetically pleasing barrier between the 9th green and the practice green. The key was picking pleasing material that will not block important seasonal sunlight and air flow, yet still provide both a sound barrier and errant shot barrier that can be aesthetically pleasing from several angles. Aesthetic improvements must be reviewed from the 9th hole approach, the practice green, the parking area and the clubhouse porch view. 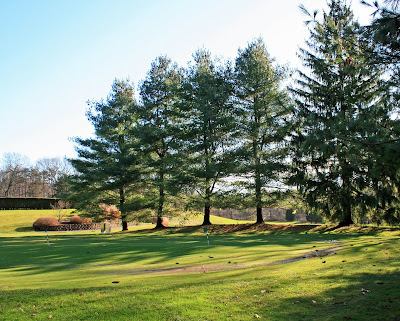 We are using a mix of specimen trees and shrubs that provide a season long barrier without being detrimental to the ultimate goals of the project. I feel confident that the members will like my choices and be pleased with the final results. We will also be planting shrub varieties along the new parking lot fence-line to enhance aesthetics and the screening of the parking lot. The planting of this material will hopefully be completed before weeks end! 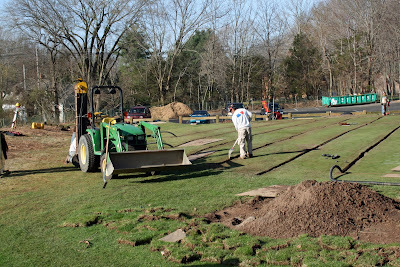 Our next step is the final improvement of the bordering turfgrass behind the 9th green, turf improvement between the barrier planting and the practice green and the sodding of the old tent area to the east of the the cart staging area. These areas will be addressed next week. We want to accomplish all facets of our project as quickly as possible during the the optimum success period of early spring. We are working hard to manage our labor in a way that provides you with consistently fine course conditions and still be able to accomplish our project goals. The tremendous early spring weather has caused us to adjust so we can provide everyone with both. We will succeed! Believe it or not, today's rain was a help in the agronomic department. While the torrential rains of late have exposed many classic and not so classic wet areas, we actually had some wilt on greens. In a normal year we would never even think about wilt on April 8th! We shifted gears quickly yesterday and fired up the irrigation system. As of noon today, we were operational short of normal fixes after a long winter. Superintendents have a tendency to get a little nervous when laying sod the first week of April and we reach record temperatures stretching into the nineties. 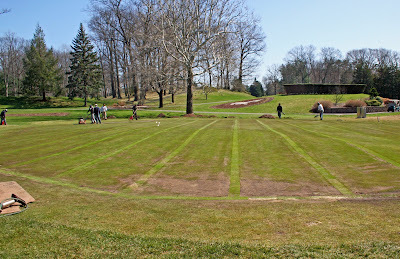 The sod was laid on the practice green and surrounds yesterday. Some of the sod that was installed on the practice green is looking a little weak. The sod was cut from a farm where the bentgrass had not yet broken dormancy. In addition, it wilted on the truck before arriving at The Farms. The next week or so will tell if some spots bounce back. If not, they will be replaced immediately. 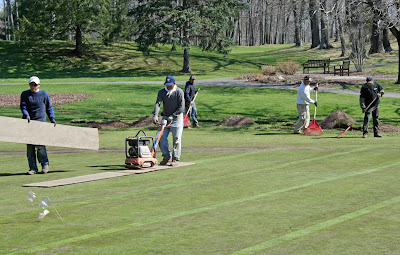 We will be performing many types of maintenance to the green in the next few weeks to facilitate a quick recovery. Remember this was major surgery! I will have a much better idea in the next week or two when we will be able to re-open the green. It will be worth the wait. We will finally have a quality practice surface and surrounds. The next big step in the project is some functional yet aesthetically pleasing landscaping between the two greens. We will be picking landscape materials which provide a barrier for sound and errant shots without creating another seventy foot sun-blocking, grass-killing wall. This will be completed before April 24th. Greens- I have heard lately that the greens are slow. Absolutely right! They are still breaking dormancy. They are healing from early aerification. It is April ninth. The air temperature may be ninety-three but soil temperatures are still near fifty-five degrees. We lowered the height of cut three weeks earlier than normal because of the weather. The greens just need time to get to the level the members are accustomed to. I'm waiting for genetics and mother nature just like everyone else. Remember... April ninth. I promise it will happen. Bunkers- The bunkers have been edged repaired and are all playable. We have added one-hundred tons of sand to improve playability. Tennis- The tennis courts are being prepared for the season and we are expecting everything to be ready for early next week. Peter Wilson will be heading up the maintenance of the tennis and clubhouse areas. He will not dissapoint! 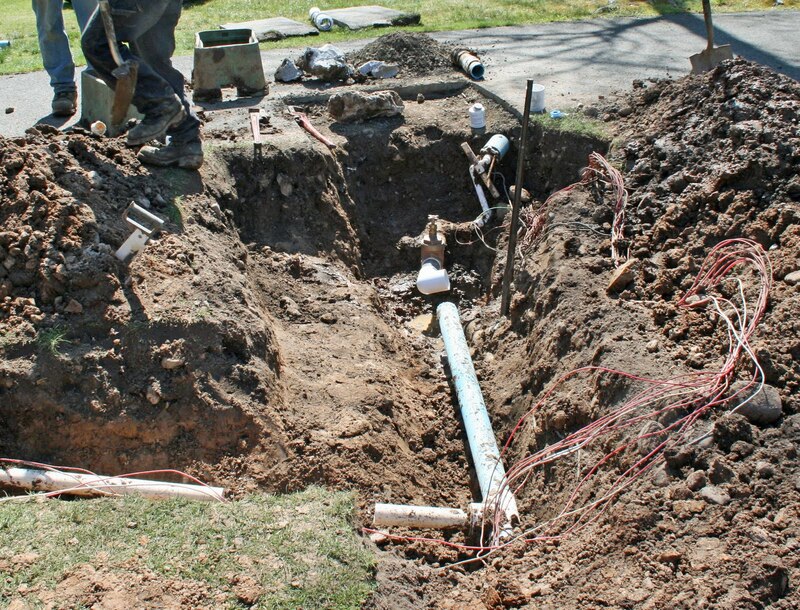 The exterior main line drainage will be completed early next week. This drainage encompasses the tie in of all lateral piping from the green. We are also re-grading the rough on the south side between the parking lot and the practice green. This area needs to be re-graded to provide proper surface drainage. Trapped surface water on the practice green is a major cause of turf failure. 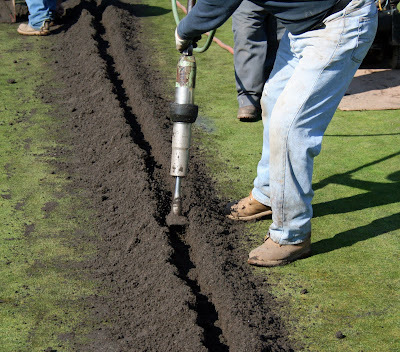 There are two important components to proper drainage. Surface and sub-surface drainage. Our construction company has two specialized crews. One crew does only sub-surface drainage on the green and the other performs both surface and sub-surface drainage on the exterior of the green cavity. The later will be in on Monday to continue the project. "On Course Construction" has been tremendous in working with us to schedule and complete all aspects of our project and more. The doubling of staffing and the incredibly specialized and professional staff has provided us with a tremendous product thus far. We are ahead of the game considering the most trying of work environments (March precipitation near double the average). Both surface and sub-surface exterior drainage to be completed. Sodding of bad spots on green and surrounds. Landscaping of area between #9 green and practice green. Landscaping of fence line bordering the parking lot. In just a few weeks the healing will be over and no one will know we were there. 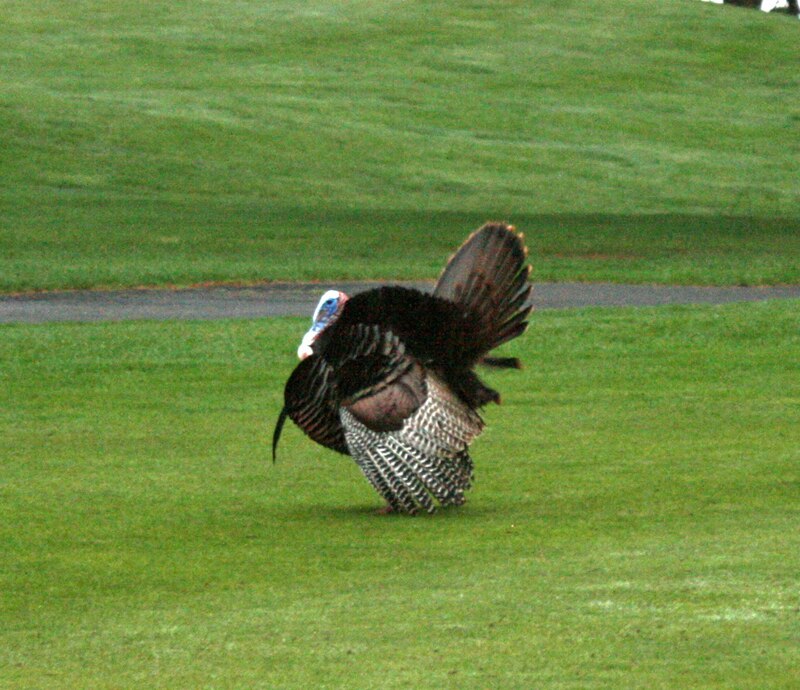 Everyone will just enjoy a wonderful, healthy and aesthetically pleasing practice green and its surrounds. Drainage Continues With Double Crew! Despite the recent rain, the drainage project is progressing well. 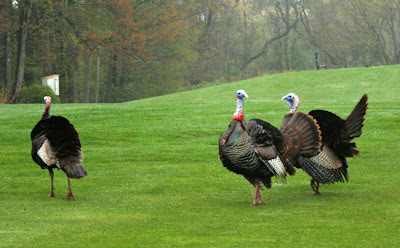 "On Course Construction" has doubled the crew size today in an effort to speed up the process. Half the trenches have already been dug and pipe is being installed. 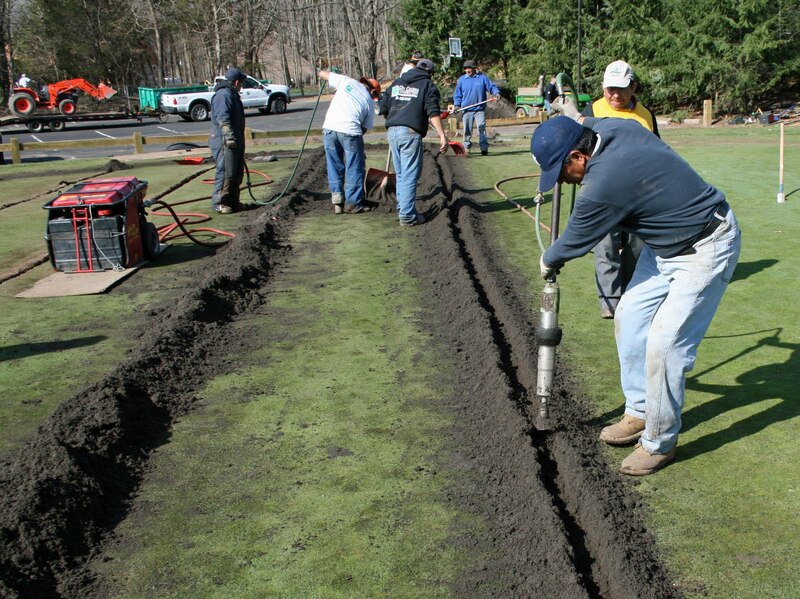 Trenching Begins On Practice Green! The drainage project on the practice green began today. The construction crew will be working tomorrow and Saturday also. We want to take advantage of the good weather and complete the project as quickly as possible.